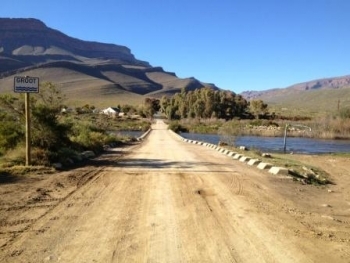 The Winkelhaak Road is a 37 km gravel farm road which meanders through the Koue Bokkeveld north of Ceres between the many rivers, dams and lakes of this farming area, specialising in onions and potatoes. The scenery is richly diverse with the dominance of the rugged mountain-scape being omnipresent. 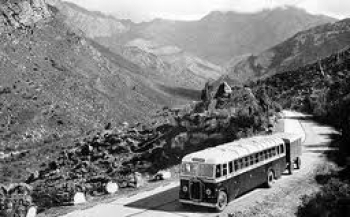 Michell's Pass (frequently misspelt as Mitchell's Pass) was named after Charles Michell who planned the original route through the Skurweberg & Witzenberg Mountains from Tulbagh and Wolseley through to Ceres. He was a talented military engineer, who perhaps gained more fame for his exploits by eloping with the 15 year old daughter of a French colonel. This might explain why he was "transferred" to the Cape of Good Hope! Michell went on to become the Surveyor-General for the Colony and designed and built several prominent Cape passes and bridges and was a major influence in road construction in the Cape, together with the popular Colonial Secretary, John Montagu, had the vision to plan a network of roads through the Cape Colony that would pave the way to a successful growth in the region's economy. 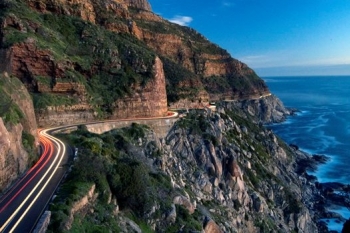 Chapman's Peak Drive dates back to the early 1900's and is without question one of Cape Town's Top 10 tourist destinations. It's popularity is due to the incredible scnery on offer viewed from a road which has been been lietrally hewn out of the almost vertical cliff faces on the Cape Peninsula's western side. The 10 km long pass connects Hout Bay in the north with Noordhoek in the south and was converted into a toll road in 2003 to cover the high costs of maintaining the road to a safe standard. Along it's length you will drive through more than 80 bends, corners and curves and see some impressive modern engineering, including massive steel catch nets and two semi-tunnels. Many sections of unstable rock-face have been been reinforced with shotcrete. This pass is loaded with drama and history dating back to 1910 and is best appreciated driven slowly. It must have seemed an impossible task building a road on such an inhospitable and dangerous cliff face, but the road building pioneers did the job! The more observant viewers will notice that we have not included our standard vertical profile nor simulated fly-past clips in the first video. The reason for this is that Google Earth simply cannot 'read' the road correctly and the results are too distorted to provide an accurate simulation. This is the only pass in South Africa, where this has occurred. 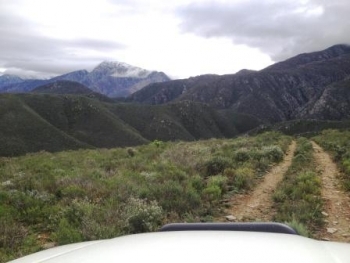 Note: This is a strictly 4x4 route. 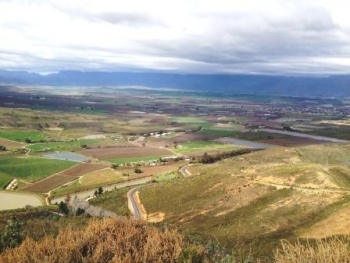 Meiringspoort is a Top 10 destination. The poort bears a tough history of floods and landslides amongst incredible hardships, yet our engineers and road builders mastered the art of building a magnificent road through this awe-inspiring poort. Part 1 covers the first 8 km. of the poort. 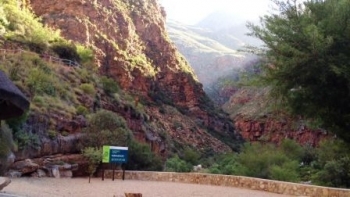 The second video covers the final 8 km and and includes the Interpretive Centre and main waterfall and ends near the charming village of De Rust. 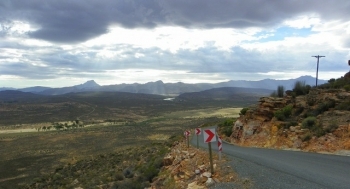 The pass is in superb condition and offers typically gentle poort gradients, but the 63 bends, corners and curves do require a high level of concentration. It's easy to become mesmerised by the mind boggling scenery, so drivers need to remain focused and understand that the lack of safety shoulders and large volume of heavy trucks means a certain level of danger is always present. It's best to drive this poort on a weekend or public holiday, when there are fewer trucks. Stop often and enjoy one of South Africa's finest poorts which is packed with history. Like its neighbouring pass, Katbakkies Pass, the Peerboomskloof Pass was originally carved out by the local Khoi people as a cattle path. 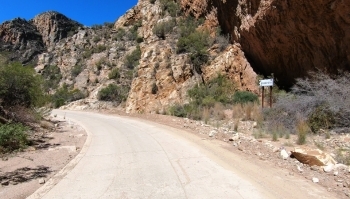 Farmers later used it as a wagon road to cross over the mountains from the Koue Bokkeveld to the Ceres Karoo. 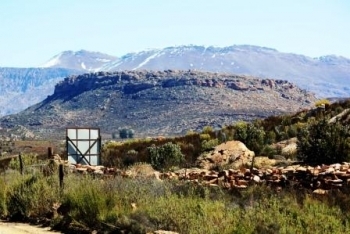 Only recently tarred and 4,5 km long, it provides picture-perfect views of the open, rugged expanse of the Tankwa Karoo and the mountain range separating it from the Koue Bokkeveld. The first 2 km of the pass are tarred and sports a stiff gradient of 1:7. This tarring was done fairly recently and the road remains narrow with no road markings, so don't be fooled by the tar surface as it is still a dangerous pass. The pass initially enters the bottom end of the poort via an S-bend. The second part of the bend is very sharp and immediately a gravel track leads off to the left which goes to a picnic area. Once the top of the tarred section is reached at 704m ASL, the surface is once again gravel, but the gradient initially remains steep as the road heads up towards the plateau section, whereafter the gradients ease off to a more comfortable 1:20. The upper portion of the pass is relatively easy. The decisively steep Katbakkies Pass traces over what was once an old sheep-trekking route over the Skurweberge mountains. 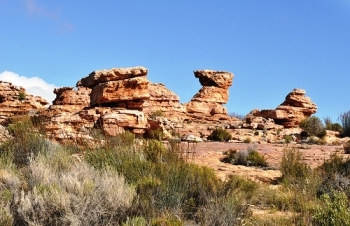 It joins the Koue Bokkeveld with the Ceres Karoo and Tankwa Karoo. It was recently (1999) tarred and although fairly short, it has a serious average gradient of 1/13 which will tax many an underpowered vehicle and especially the two sections about quarter way up the western ascent, which measure out at UNDER 1:4! The pass is sometimes covered in snow during winter as the snow line of 1000m ASL is well below this pass's maximum altitude of 1200m. It's a narrow road and has no road markings, so take it slowly and enjoy the spectacular barren landscape.